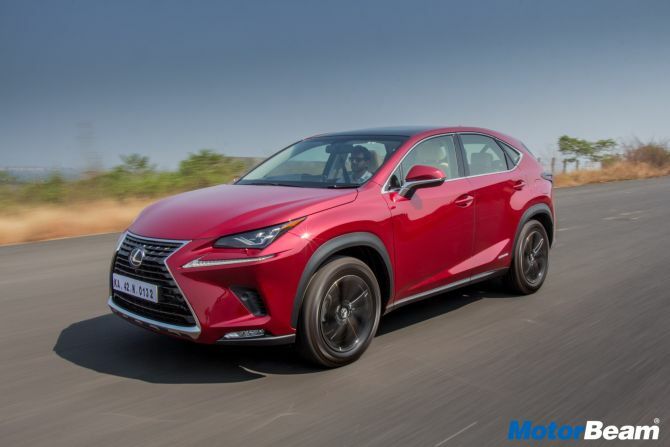 Just when the Indian luxury car market has started to see a big boom, Lexus has launched its fourth offering, the NX300h, where NX stands for Nimble Crossover (X). 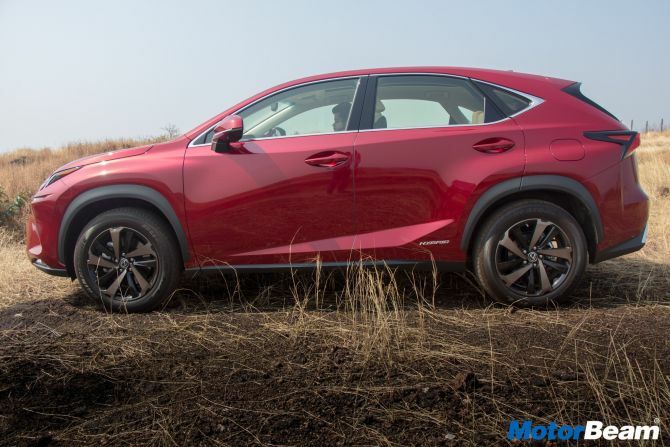 Indian automobile website MotorBeam.com takes the crossover for a brief spin to find out what it has to offer. 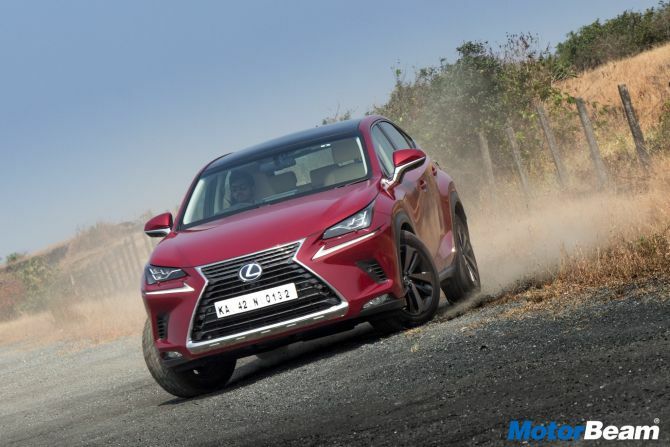 Design and styling is where the Lexus NX300h scores full marks in our books. This is easily the best-looking car in the segment. Up front, there is the signature spindle-shaped grille and LED DRLs that take the shape of an L.
The LED headlights do look the part while the heavily sculpted bumper gives the front fascia some aggression. The car is available in two variants - F-Sport and Luxury. The one we're driving is the latter which gets 18-inch alloy wheels finished in black and copper. At the rear, there are LED tail lamps with dynamic turn indicators and the vehicle looks butch, especially when viewed from the rear. 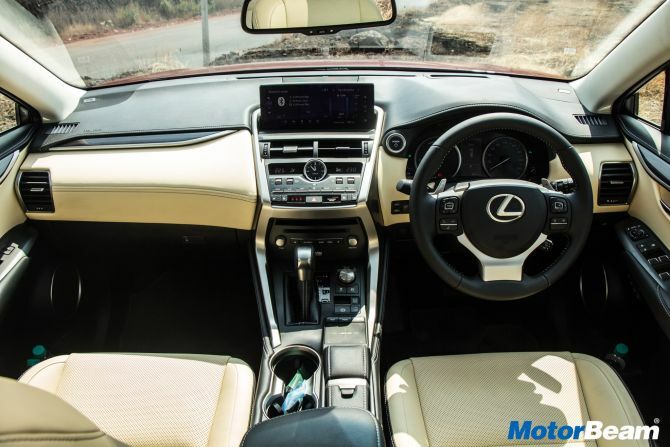 The Lexus NX300h gets a heavily sculpted dual-tone dashboard. The steering wheel houses a plethora of buttons and a 10.3-inch touchscreen infotainment system sits flush in the centre console. The infotainment system can also be controlled via the touchpad in the centre console. 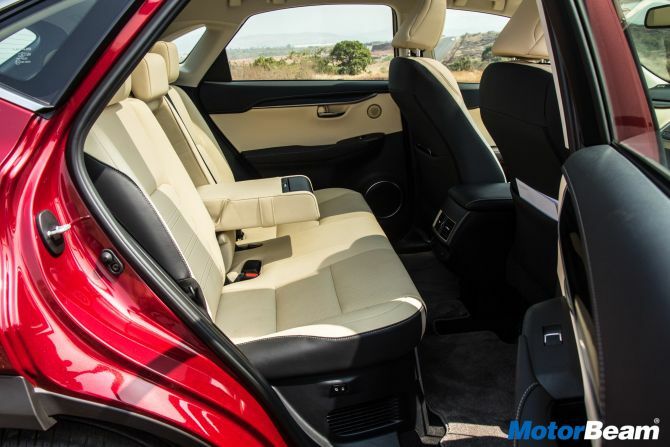 The soft-touch materials and the premium leather upholstery uplift the ambience. In terms of features, you get cruise control, fixed panoramic glass sunroof, automatic climate control, powered tailgate with kick sensor, Mark Levinson 14-speaker audio system and Navigation. Talking about seat comfort, both the front and rear seats are highly comfortable and supportive. They are electrically adjustable and get ventilation (only in Luxury trim and only for the front seats) and heating functions (only for the front seats in F-Sport grade). There is ample knee room at the rear but headroom is slightly on the tighter side for tall passengers while under-thigh support too is lacking. The 'h' in the NX300h signifies that this is a hybrid car. The NX300h comes powered by a 2.5-litre engine which produces 153 HP of power from the engine alone and when combined with the batteries, the power output maxes out at 195 HP. Torque is rated at 210 Nm. The hybrid powertrain comes married to an e-CVT transmission. In terms of performance, the low-end feels punchy and strong with no lag as such. The vehicle is super-refined at idle and one has to constantly keep checking whether the car is really switched on or not. Only post the 3000 RPM mark, you actually get to hear the engine. There is a pure EV mode as well but with limited range. The mid-range is quite punchy but as the car starts to reach the redline, it starts to feel stressed. The NX300h weighs nearly two tonnes and that quite hampers the performance. Overall, the performance from the NX300h is just satisfactory. The 6-step e-CVT gearbox gets a Sport mode and there are steering-mounted paddle shifts as well. The typical CVT gearbox trait is evident as there is some lag and post the 5000 RPM mark you can hear the conventional whine of the gearbox. There are four driving modes on offer - Normal, Eco, Sport S, Sport S+. 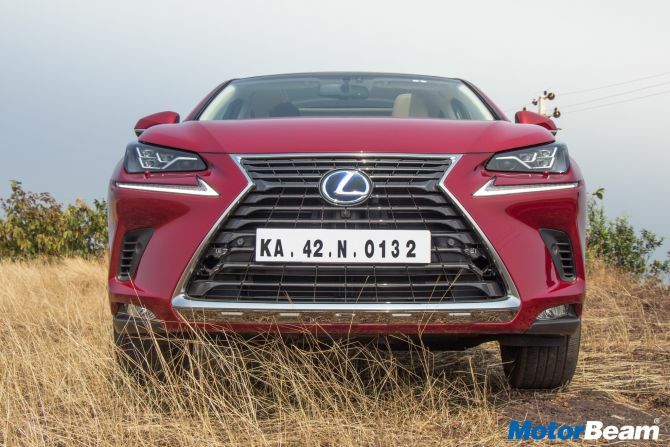 Lexus claims a mileage of 18.32 km/l but in real-world conditions, expect a fuel-efficiency of around 14-15 km/l (on a light foot). The NX300h gets Adaptive Variable Suspension which alters the damper settings. The suspension is sprung on the softer side, especially at the rear and this gives it a fantastic ride quality, though, only at low speeds. There is a lot of vertical movement at high speeds and body roll too is quite evident. Nonetheless, there is immense grip from the tyres and the steering offers superb feel and feedback. The brakes have a good initial bite but under heavy braking, the car tends to nosedive. 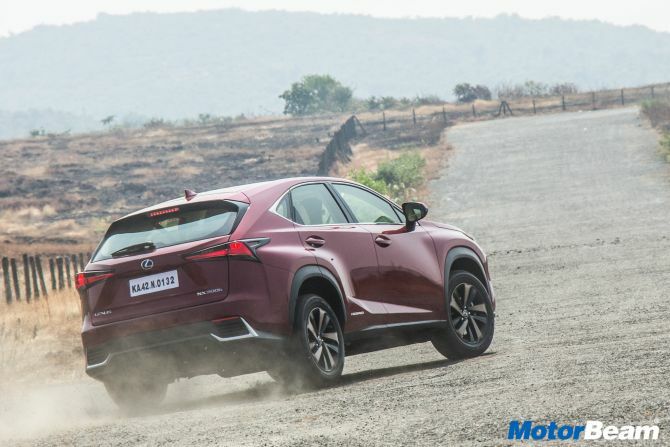 In spite of being an AWD vehicle, the NX300h isn't a proper off-roader all thanks to the low ground clearance. 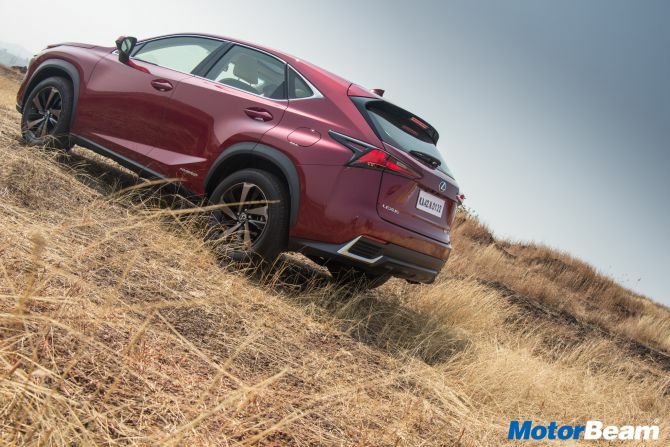 In terms of safety, the Lexus NX300h gets 8-airbags, Head-Up display, ABS with VSC and Hill Start Assist. Quality of Lexus' after sales service is unquestionable but the Japanese automaker's reach is limited across the country. This car might not offer bang for the buck but in terms of appeal and desirability, it is one of the best in the luxury compact SUV segment.